AN AMBITION HISTORICAL SAGA, SPANNING TWO WORLD WARS, THAT REFLECTS ON ANTI-SEMITISM AND THE CHALLENGES OF ASSIMILATION FOR A NEW AMERICAN FAMILY. Born in New York in 1917, Will Eisner was the author of the legendary comic strips The Spirit. 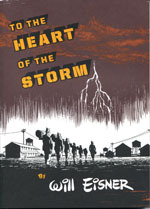 Over the course of a career that exceeded seventy years, Eisner wrote dozens of books, including the pioneering graphic novel A contract with God. The comic industry's top annual awards "The Eisner's", are named in his honnor.